Prizes can be collected from Ashby de la Zouch Town Council Offices, Legion House, South Street, Ashby, LE65 1BQ. 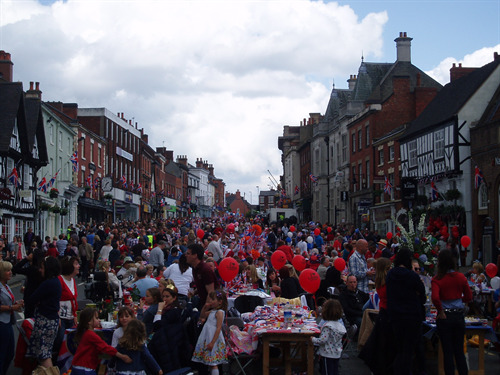 After the success of the Diamond Jubilee Street Party an additional 120 tables have been provided. Tables will stretch the entire length of Market Street from Huntingdon Court to the Card Factory. Events will include a traditional fun fair on Brook Street, music, sing-a-long and Best Decorated Table Competition. If you were unsuccessful in obtaining a table for the street party on Market Street you could organise your own street party. Guidance is available on North West Leicestershire District Council's website, follow this link. Further details about arrangements for the Street Party for people who were successful in booking a table are being sent out week commencing 16th May. An overview of the table layout can be viewed by following this link.